Offering a great value drive-up and drop-off service, Smart Park operates at all Heathrow terminals and is perfect if you're travelling with children, weighed down by heavy bags or just looking to add a little VIP to your trip. Head for the terminal, grab your bags and let a Smart Park chauffeur do the rest. No transfers are required with this meet and greet service. CCTV, security fencing and regular security patrols. This service is perfect for any passengers requiring any extra assistance. This service operates between 04:00 and midnight. Airport Access Fee of £3.50 must be paid direct to the airport at the exit barrier. Terminals 2 & 3 are in the centre of Heathrow and can be reached via M4 Junction 4, M25 Junction 15, and the A4. Terminal 4 is to the south and can be reached via M4 Junction 3, M25 Junction 14, and the A30. For Terminal 5, leave the M25 at Junction 14, following signs for Heathrow Terminal 5. Follow these instructions to find your designated drop-off point. Follow signs for Terminals 1, 2 & 3. Drive up the rampcalled "Terminal 2 departures" and follow the road to the right, head under the height restriction arm. Choose Lane 5 or 6 towards the ticket machine which will take you to Level 4 Short Stay car park. Take the barrier ticket and enter the car park, Entering the car park on Level 4, keep right following the signs for Off Airport Parking Meet & Greet. Here you see one of our drivers who is based near the ticket pay machine, who will have all your booking details and will be wearing a black jacket. Follow signs to ‘Short Stay Car Park 3’. At the entrance barrier, take a ticket (no fees will be payable). Drive up the ramp, exit at level 4. Follow the road until you reach Rows A at the far end. Park in Row A and a Smart Park chauffeur will be waiting near the ticket machine. Drive to the Short Stay Car Park level 2. Follow signs for Off Airport Parking Meet & Greet (Exit End Lift Lobby Area). Go to the Drivefly desk and you will be greeted by one of our chauffeurs. Follow signs for ‘Short Stay Passenger Pick-Up’. Head up the ramp and keep to the right, driving under the height restriction arm. Keep left and pick up signs for ‘Short Stay Level 4’. Follow ‘Avis’ signs towards the third set of barriers. At the barrier, take a ticket (no fees will be payable). 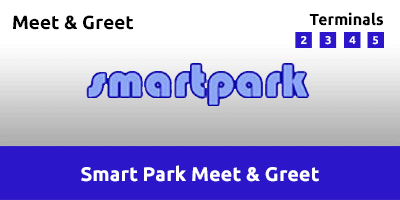 Follow the arrows and ‘P-Off Airport’ signs to Rows R & S.
Simply let Smart Park know that you’ve landed. A number will be provided when you arrive. A member of staff will be waiting to hand over your car.